The British Sovereign Gold Bullion Coin has a history that dates back more than 500 years and continues to be one of the most recognizable bullion strikes in the world today. The Sovereign was first struck by the Royal Mint of England in 1489 while Henry VII was on the throne. Its inclusion of a design of the King led many to call the new strike a ‘Sovereign’, which it still goes by today. Production continued on the sovereign until 1604 when the coins disappeared for over 200 years. The modern Sovereign returned in the early 1800’s, but it was not until 1871 that the reverse of the strike took on a new design still seen on the coin today — that of St. George and the dragon by Benedetto Pistrucci. Production on the Sovereigns continued until World War I when the Royal Mint once again ceased production (however, branch mint’s continued to strike them until 1933). They returned again in 1957 and appeared most years in either bullion or proof form. 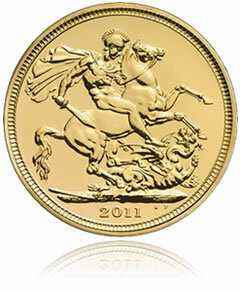 Finally, in 2000 the bullion Sovereign returned and has been produced annually since. The obverse of the modern Sovereigns show a portrait of the king of queen. For more than half a century, this has been Queen Elizabeth II. The most recent image of her was designed by Ian Rank-Broadley. Also shown on the obverse are the inscriptions of ELIZABETH, II, DEI, GRA, REGINA, FID, DEF. The reverse includes the aforementioned St. George and the dragon design by Benedetto Pistrucci as well as the year mark. Each Sovereign is struck from 22-karat gold and contains 7.3224 grams of the precious metal. While popular, the coins are not of the same size many associate with gold bullion strikes as they do not contain a full ounce of gold like bullion products from other world mints. However, collectors and investors do not seem to mind as they still purchase the strikes by the thousands.